Dinner on Saturday was burger and chips… sort of. The burgers were made with beef mince. When I buy mince I tend to buy 600g of a higher quality mince and divide it into quarters, freezing each quarter and using them for meals over a couple of weeks. This way I make sure the meat is of a good quality rather than quantity in a meal. I then use vegetables or pulses to bulk up the meal. The ‘bulk’ in these burgers is butter beans and oats. Oats are high in fibre, whole grain and help to lower cholesterol (Read more about the benefits of oats on the BBC website). They also add to the texture of the burger without changing the taste. I used butter beans as they were in the cupboard and they’re a favourite of my husband. However your bean of choice would work well too. See twists below for more ideas of how to adapt the recipe. I served the burgers in a wholemeal roll with paprika potatoes. They pretty easy to make. Just thinly slice a couple of medium potatoes (I used white potatoes but sweet potatoes should work too). Toss them with a drizzle of vegetable oil and smoked paprika, before placing them on a lined baking tray and cooking in the oven along with the burgers. 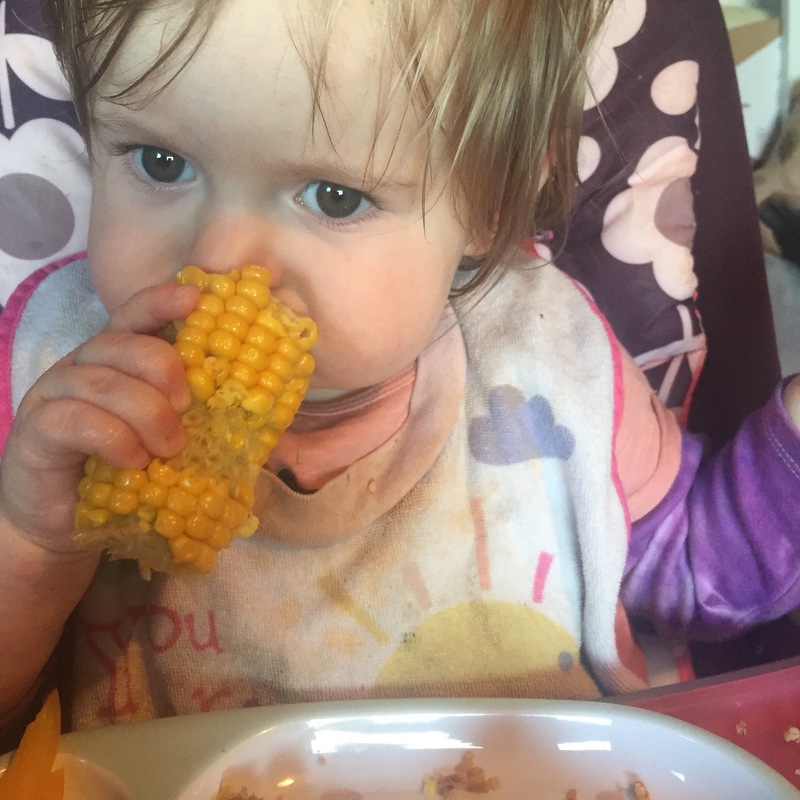 Little one was also introduced to corn on the cob as well. 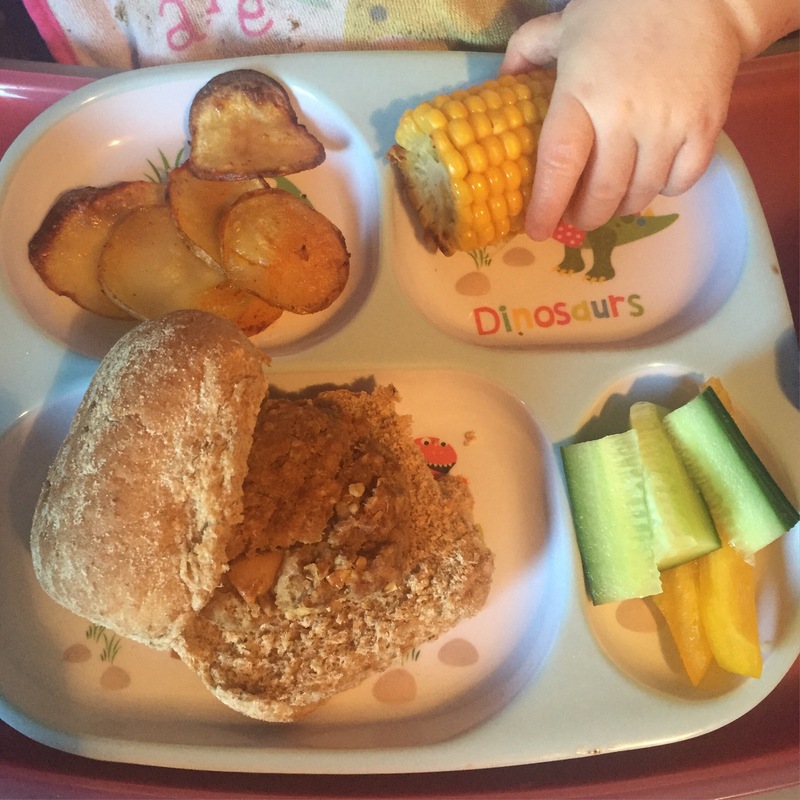 She loves sweetcorn, so I was excited to see what she made of it on the cob. Even after much demonstrating, she insisted on eating it like a banana with a massive smile on her face. I think it was a winner! 1. In a food processor blitz together all the ingredients until combined. Add a little more oil if the mixture isn’t coming together. Divide the mixture into 4. Roll each quarter into a ball and flatten into a burger shape. Repeat until you have 4 burgers. Pop in the fridge to chill for 30 minutes. 2. While the burgers are chilling, pre heat the oven to Gas Mark 7, 200 C and line a baking tray with greaseproof paper. 3. Remove the burgers from the fridge and brush with a little oil on both sides. Place on the baking tray and pop into the oven. Cook for 30-40 minutes turning half way through. 4. Check the centres of the burgers are hot and cooked through. Serve in a wholemeal bun with salad. Replace the butter beans with chickpeas, kidney beans, black eyed peas etc. Spice it up with chillies or cayenne pepper. Leave out the cumin and add mixed herbs instead. Use pork, chicken, turkey or lamb mince instead of beef. Dairy, egg, nut and soya free. Depending on the oats you use, gluten free too. I just wanted to tell you that the mum I babysit at wants to say a huge thank you for all your amazing recipes that are so good and healthy 😀 She is not Vegan but sees how good that kind of food is!